I discovered that Microsoft Office 2007 has a blog feature. This is a great way to blog for someone who is on dial up, or for people like me who need to go back to school and take English Composition 101. This is a test post so who knows what'll happen. 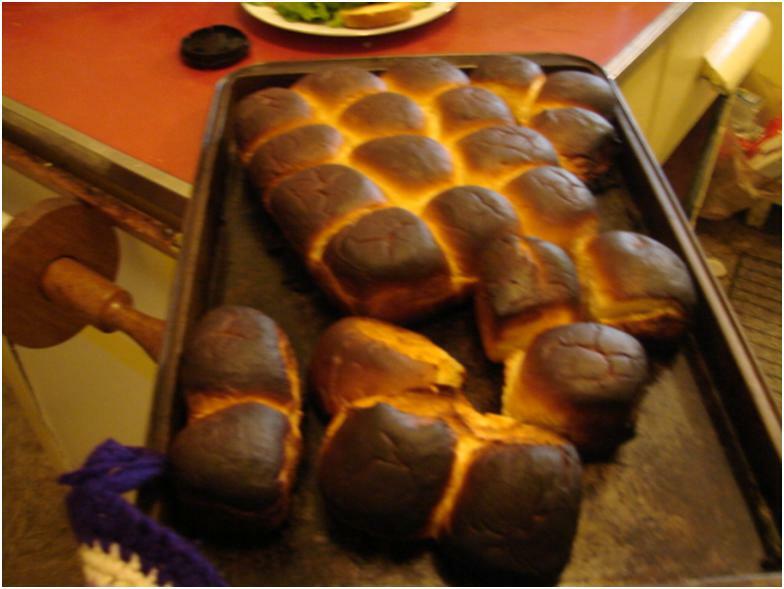 So, what photo to add to a test blog, how about the burned biscuits from Thanksgiving Day dinner? Mike brought the biscuits and they were doomed from the beginning. First they were put on a cookie sheet and precariously placed on top of the upper oven awaiting their turn. When Annie opened the upper oven door they came crashing down and landed upside down all over the kitchen floor. We invoked the 5 second rule and three women were scrambling around on the floor picked them up as fast as they could while counting out the 5 seconds, one thousand one, one thousand two, etc….I was up to my elbows in lettuce and laughing so hard I couldn't get a picture. But I did get a picture of the biscuits that once they made it into the oven were forgotten, until smoke came pouring out and the smoke alarm went off. Who said too many cooks spoil the stew. Or should that be too many mimosa's burn the biscuits.